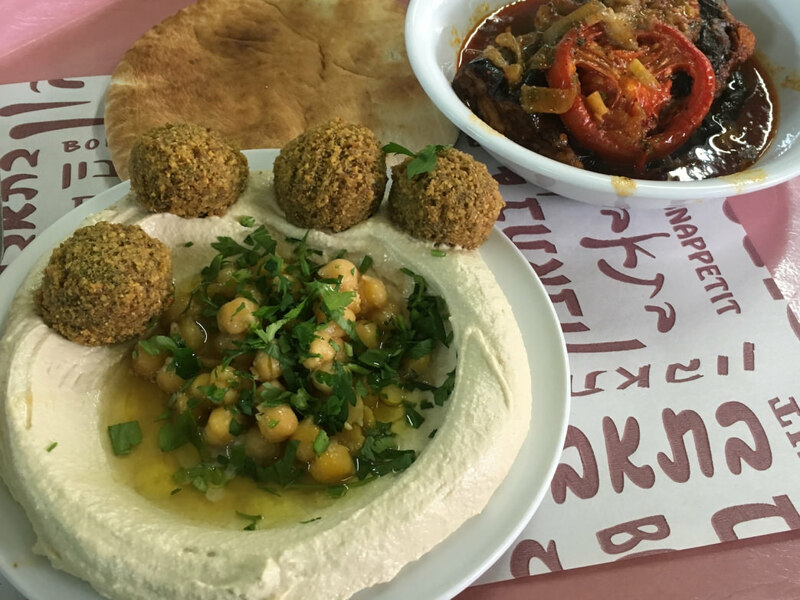 Food in Israel is a mouthful of adventure—a blend of flavors that have been slowly mixing for thousands of years. This tiny Middle Eastern country, which is tucked along ancient trade routes between Asia and the Mediterranean, produces bountiful crops and infuses seasoning from across the region. The result is fresh, healthy, and frequently vegetarian cuisine. 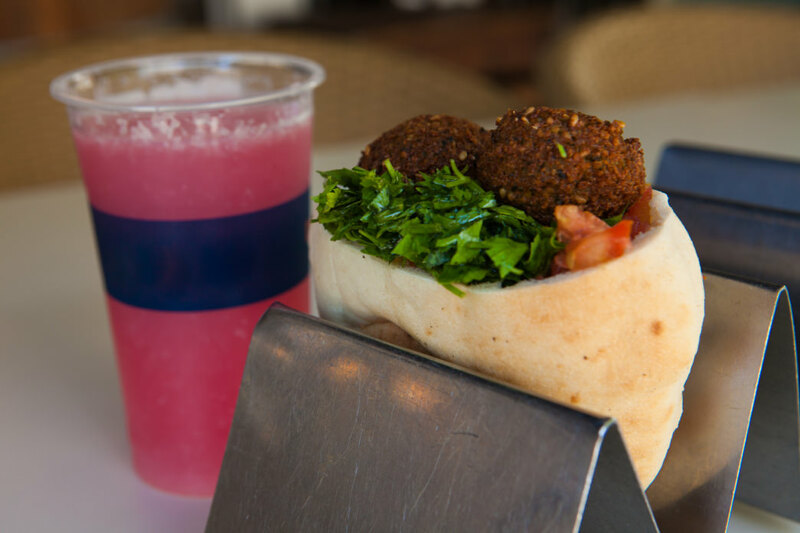 Think falafel, hummus, olives, eggplant, and savory stews. And everywhere, cucumbers and tomatoes seem to take center stage. Whether you’re fueling up for a big day, packing snacks to take on the trail, or basking in a post-adventure glow, you’re sure to find something to tantalize your taste buds. And good news: safe drinking water means you can let loose with the menu—raw foods are just fine. Here is our advice on adventurous eating in Israel. 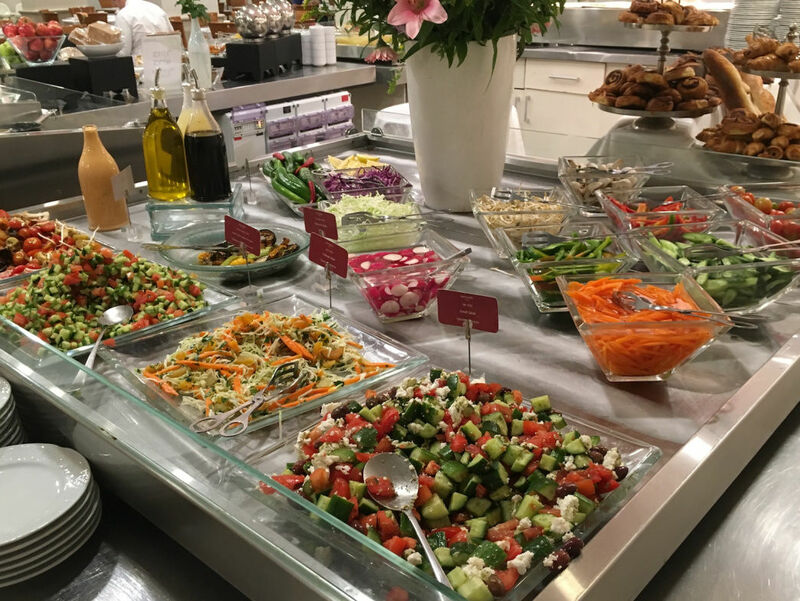 The hotel buffet (we’re not kidding): The cultural influence of Kibbutzin (Israeli collective farms) reveals itself at breakfast, when many hotels lay out lavish buffets. You don’t have to stay in five-star hotels to experience this, even lower-priced accommodations offer elaborate spreads that will make you wander with a plate, trying to whittle down choices. It’s often a dizzying array of soft cheese, hard cheese, cottage cheese, mystery cheese, salads, olives, eggs, fruit, vegetables, pastries, yogurt, cereal, and casseroles. Just don’t expect bacon—it’s not kosher. If you like huevos rancheros, try the shakshuka, a peppery tomato stew with fried eggs. 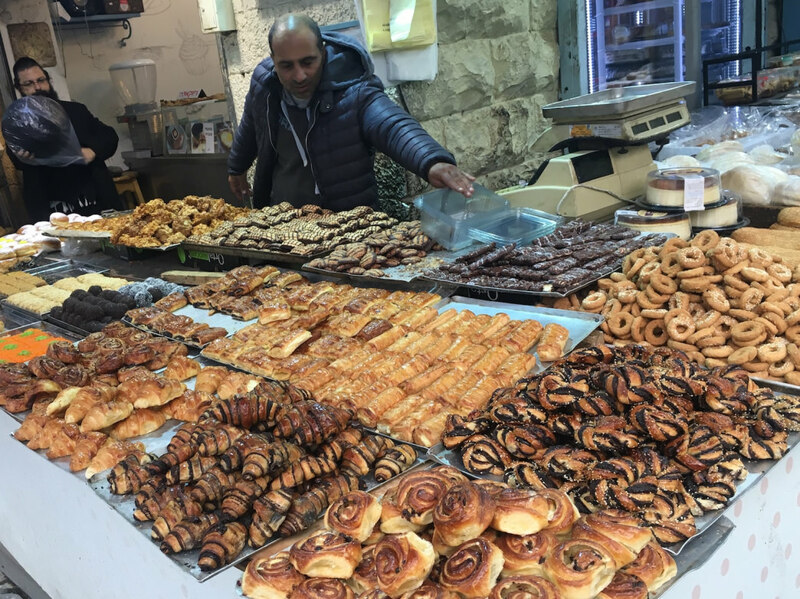 Break bread: For breakfast on the run, stock up on baked goods from a local market, like Carmel Market in Tel Aviv or Machane Yehuda in Jerusalem. The piles of pastries will make you drool. Ask for burekas, buttery puffed pleasures stuffed with spinach, cheese, and potato (or sometimes meat). 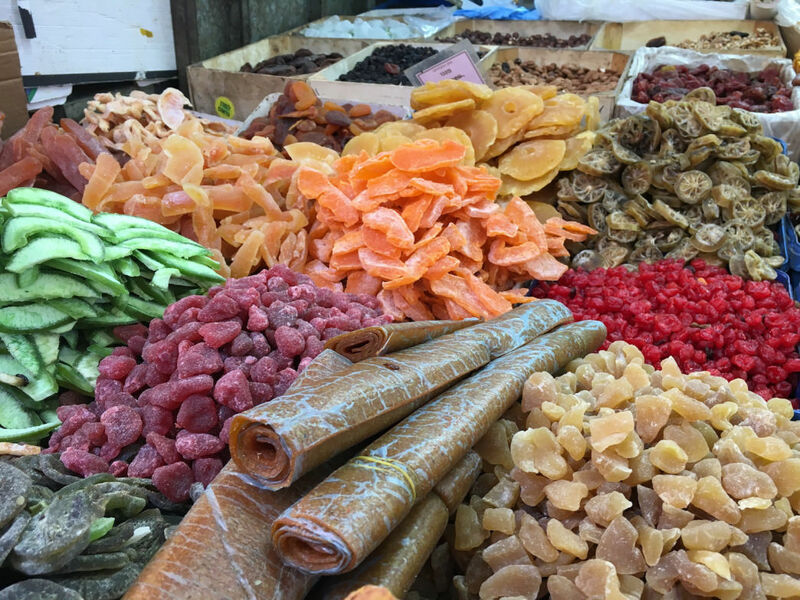 Dried fruit and nuts: Israel’s northern regions are the country’s fruit basket, with carefully tended orchards and farmland that crank out bushels of crops. It doesn’t take long for food to make it from farm to table, which might explain why the country’s dried fruit and nuts seem to be among the best in the world. Swing by a market (see "break bread" above) and blend your own perfect medley, choosing from colorful piles of figs, dates, kiwis, raisins, papaya, currants, cherries, apricots, ginger, strawberries, mango, watermelon, and enough nuts to make you go nutty. 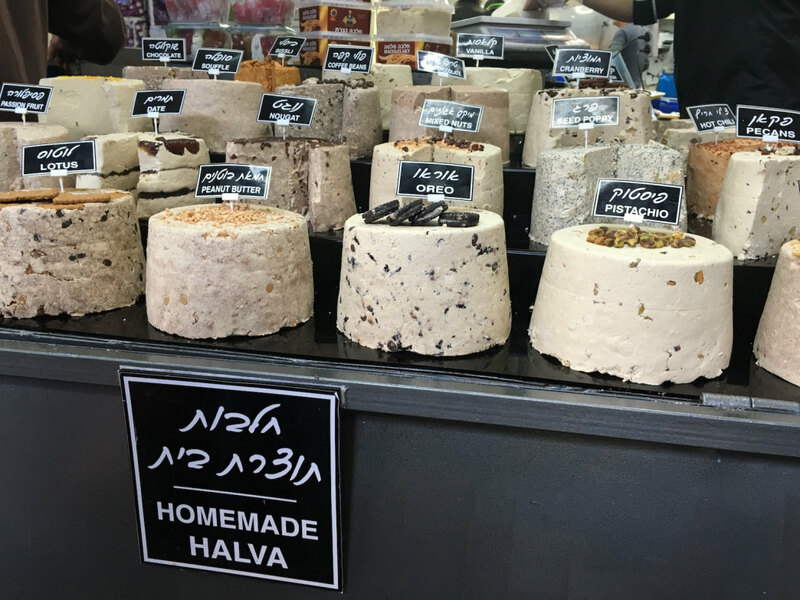 Halva: Halva, a sweet sesame-paste concoction that might accompany breakfast, is also good for a sugary protein boost on the trail. Local markets sell it by the slice (or wedge), which you can tuck in your backpack for days. Eat it by the crumbly finger-full. Just be careful: it can be addictive. Turkish coffee: If you’re out on the trail with a guide, don’t be surprised if every trailhead, pass, peak, and overlook is a cause for a coffee break. Take a seat on the ground, bust out some snacks, and relax while the camp stove fires up boiling water. Sip the brew by the small cupful, taking care not to tip the coffee grounds into your mouth. Beer: Hardly anything beats a cold brew after a long day outdoors. The most popular Israeli beer, Goldstar, is a smooth-drinking ale that’s easy to find. If you want to stray from the mainstream, go tasting at the Beer Bazaar, which pours more than a hundred Israeli craft beers at Carmel Market in Tel Aviv. Hummus: Hummus turns up from dawn ’til dusk. And in Israel, it’s unbelievably smooth and creamy, gliding across your tongue with a tangy, earthy twang. Expect a pool of olive oil on top, and perhaps a sprinkling of parsley and chickpeas, which you can scoop with a triangle of pita bread. 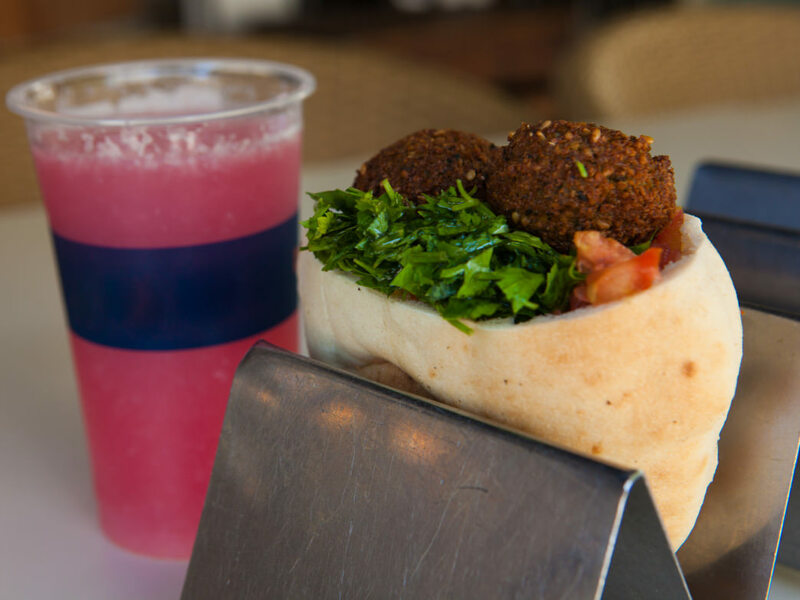 Falafel and pomegranate juice: Crispy, golden falafel balls—a blend of mashed chickpeas and spices—are an Israeli mainstay. You’ll find them on many restaurants’ menus, as well at order-on-the-go places. A falafel pita is a sandwich version stuffed with a medley of fixings, including cabbage, cucumber, tomato, tahini, and cheese. If you have a tongue that’s adapted to heat, say yes to Yemeni schug, a bright green cilantro-pepper sauce that adds a fiery kick. Cool off with a glass of fresh-squeezed pomegranate juice, a healthy anti-oxidant-rich elixir that’s good for cardiovascular health. 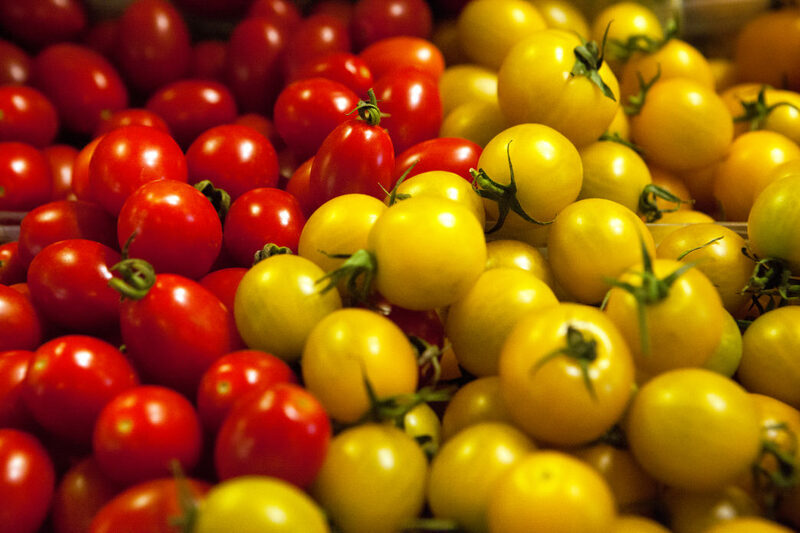 Cucumbers and tomatoes: Israel’s cucumbers and tomatoes might outdo the rest of the world. Almost every meal in Israel includes them, frequently diced into a salad, delivering a fresh crunch with sweet sidekick that eclipses the flavor of the same combination at home. A variation includes olives and tangy, crumbly cheese. Meats and vegetables: While vegetarian fare is widespread in Israel, meat isn’t shy about showing up. Turkey schnitzel, chicken drenched in flavorful sauces, lamb kabobs, and schworma (slivers of spit-roasted meat) might vie for attention alongside grilled vegetables like eggplant, peppers, artichokes, and zucchini. 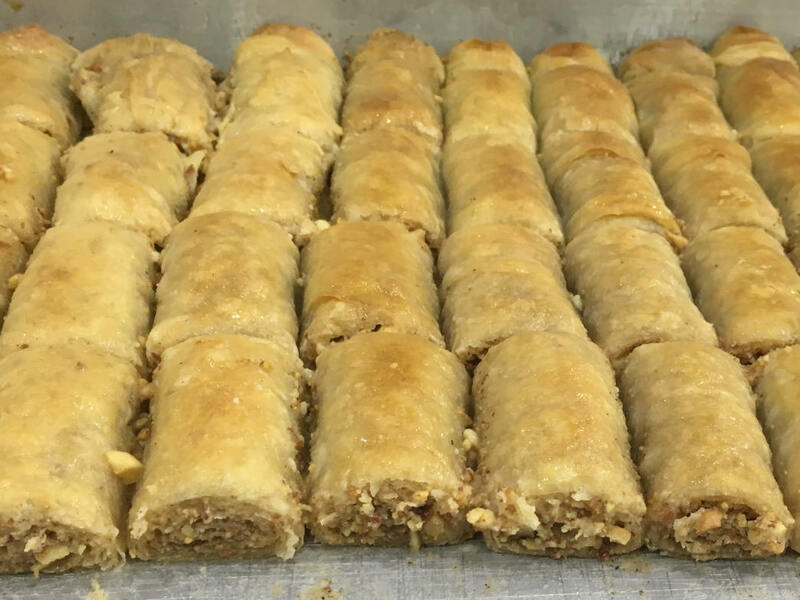 Baklava: The nutty, honeyed layers of this melt-in-your-mouth pastry slather your tongue with sweetness and make your head swoon. Just a little piece will do. Knafeh: Skeptical Western palates might be mentally confused by this Arabic dessert, a layer of cheese topped with shredded pastry, sweet syrup, and pistachios. Don’t let your mind sway you—this sugar bomb delights with the contrast of sweet and savory accented by a distinctive crunch.